Welcome to the travelogue of my trip to Paris and London. In the following pages you'll find an account of my trip as well as some of the photos I took. I hope you enjoy reading about this trip as much as I enjoyed writing about it. Be sure to sign the guest book and view what other people have written. I've tried to make this travelogue as easy to use as possible. To view a larger version of any of the images simply move your mouse over the image and a larger version will appear. To navigate use the next and back links found on every page, or to jump to a specific page simply move your mouse over the calendar icon at the top of the page and click on the day you would like to view from the calendar that appears. I've also included links to many of the places I visited in case you'd like to learn more about it or want to plan a trip for yourself. Unfortunately, due to the dynamic nature of the web, some of the links may no longer work. If you happen to find any broken links, please notify me and I'll either update or remove them. My friend Joel met me at the airport right at the time and place he said he'd meet me. (That's what I call a great friend.) 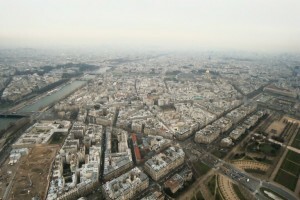 We then took the RER and Metro to The Golden Tulip in Porte de Saint-Cloud where Joel is staying. Paris has a wonderful public transportation system. The RATP consists of buses, the Metro (subway), and the RER (regional train). Being the good friend that he is, Joel decided to call in to work and take the day off to show me around the city so I wouldn't get lost the rest of the trip. 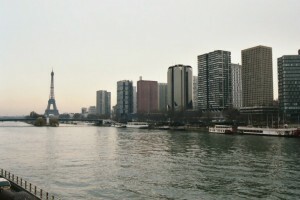 We walked along the Seine river to the Eiffel Tower where we saw some wonderful views of Paris. I was very impressed with the Eiffel Tower. It's hard to imagine that this magnificent tower was built in 1887 before the use of computers. We then stopped for lunch where I had an omelet with frites (fries). From there we walked around some of the parks near the Louvre and had dinner in the food court at Carrousel du Louvre. We then took a bus back Porte de Saint-Cloud. Along the way we passed the Eiffel Tower all lit up with it's powerful beacon rotating across the city.